Forma de citar: Castaño, D., C.M. (2013). Defining and characterizing the concept of Internet Meme. Revista CES Psicología, ó(2),82-104. The research aims to create a formal definition of "Internet Meme" (IM) that can be used to characterize and study IMs in academic contexts such as social, communication sciences and humanities. Different perspectives of the term meme were critically analysed and contrasted, creating a contemporary concept that synthesizes different meme theorists' visions about the term. Two different kinds of meme were found in the contemporary definitions, the meme-gene, and the meme-virus. The meme-virus definition and characteristics were merged with definitions of IM taken from the Internet in the light of communication theories, in order to develop a formal characterization of the concept. Lastly, the use for characterization and research of the developed concept is exemplified by analysing two internet memes. Palabras claves: Meme, Internet Meme, Lamarckism, Darwinism, Viral Propagation (Media). La presente investigación tiene como propósito crear una definición formal de "Meme de Internet" (IM) que pueda ser usada para caracterizar y estudiar este tipo de memes en contextos académicos como las ciencias sociales, de la comunicación y las humanidades. Para esto, diferentes perspectivas y usos del término meme son analizadas y contrastadas, creando así un concepto actual que sintetiza la visión de los diferentes teóricos de los memes. En esta fase se encontraron dos tipos diferentes de definiciones contemporáneas de meme, el meme-gen y el meme-virus. La definición de meme-virus fue usada y combinada con definiciones de IM tomadas del Internet usando teorías de la comunicación, esto con el propósito de desarrollar una definición formal de dicho concepto. Finalmente, el concepto construido de IM es ejemplificado en su uso para caracterización e investigación en el campo de lo IM, analizando dos memes de Internet. Keywords: Meme, Meme De Internet, Lamarckismo, Darwinismo, Propagación Viral (Media). The meme concept is an academic concept coined in 1976 by the biologist Richard Dawkins in his book The Selfish Gene. He proposed the term meme as a Darwinian, gene-centred approach to cultural evolution, defining it as "the unit of cultural transmission". Nevertheless, nowadays it is possible to find the concept of meme almost everywhere on the internet, not making allusion to the concept created by Dawkins, but relating to certain kinds of images, jokes or trends popular within the cybernauts. Since 1976, the term meme has evolved, changed not only by different authors and theorists that follow or criticize Dawkins' theory, but also by its creator (Dawkins, 1993). The roots of the concept grew distant from its primal definition from a Darwinian perspective, and began to grow in different ontological directions. This can be seen in the different uses theorists make of the term, e.g. by Blackmore (1999); Dawkins (1976, 1993). The present research will explore the implications and variations of concept by different authors and create a synthesis among their characteristics in order to create an updated concept of meme. However, the concept of meme has gone beyond the academic definition; this due to the expansion of the computer usage and the exponential growth of the Internet, particularly forums, chats, blogs and social networks; the concept was coined to a new form of internet communication. Meme is now, somehow, related with what Dawkins define as a meme, but with some special characteristics due to their way of transmission and speed of replication. The present research addresses these new memes as Internet Memes (IM). It is important to understand the transition between Dawkins' Meme and the IM in order to understand the characteristics of the memes of the new era. In addition, introducing an analysis of the transition of the concept will facilitate future research about both memes and internet memes; providing a theoretical, historical and bibliographical basis for the concept of IM. Finding a formal definition of Internet meme is not easy. Theorists have not defined it or characterized the concept of IM in an official manner that can be used and excerpted by academics. It is important to create a formal definition of IM in order to facilitate their study in scholarly contexts (e.g., cultural analysis). Meanwhile, on the internet the use of the term meme has grown in exponential proportions, that it is possible to say that the term meme is a meme itself (Sperber, 1996, p. 101). The present research is articulated as follows: first, I will introduce the concept of meme from different perspectives, starting with the former definition by Dawkins and following by other authors as Sperber, Blackmore, Dennet and Olesen. This aims to familiarize the reader with the different perspectives about the concept of meme. Next, different nuisances in the diverse uses that the authors give to the concept will be assessed. Consequently, the different elements stated above will be used in order to synthesize a contemporary, formal and academic definition of meme. In the following section, the mentioned definition will be contrasted with definitions of IM taken from unofficial sources (Internet web pages) and critically compared using communication sciences theories in order to create a formal definition of Internet meme. In the end, this definition will be used with three IM in order to exemplify its use and to study and characterize memes found on the Internet. In this chapter, perspectives and definitions worked by different theorist about memes will be introduced. However, no critical discussion will be carried out as the only purpose of this chapter is to familiarize the reader with the different theories and perspectives of the authors. Diverse nuisances will be highlighted and critically analysed later on in the text, in light of teleological understanding of the concept. We need a name for the new replicator, a noun that conveys the idea of a unit of cultural transmission, or a unit of imitation. 'Mímeme' comes from a suitable Greek root, but I want a monosyllable that sounds a bit like 'gene'. I hope my classicist friends will forgive me if I abbreviate mimeme to meme. (Dawkins, 1976, p. 192) [The italics are from the author]. Some examples of memes are tunes, ideas, catch-phrases, clothes fashions, ways of making pots or of building arches. Just as genes propagate themselves in the gene pool by leaping from body to body via sperms or eggs, so memes propagate themselves in the meme pool by leaping from brain to brain via a process which, in the broad sense, can be called imitation [...]. As my colleague N. K. Humphrey neatly summed up an earlier draft of this chapter:'... memes should be regarded as living structures, not just metaphorically but technically" (Dawkins, 1976, p. 192) [The italics are mine]. The previous idea shows how Dawkins creates a term that represents an indivisible, gene-like cultural unit, able of propagation from person to person with the help of imitation. This unit possesses a proper power that allows its reproduction and spread. In addition, Dawkins defines meme based on the notion of replicator (applied to culture). A replicator is a biological or chemical singularity of indivisible proportions. This "molecule" acts as a template, and has the capacity of creating copies of itself. (Dawkins, 1976, p. 15) Furthermore, Dawkins states in his book three properties that a replicator should encompass in order to be "successful" (that is, to manage to make copies of itself): a) Longevity is the amount of time the replicator can live or otherwise the amount of time it can reproduce itself. b) Fecundity is the rate at which copies are done. c) Copy-Fidelity is the precision of which copies of itself can be created, taking into account that every replication process generates a certain amount of mistakes every time a copy is made. Other concepts linked to the memes' proprieties uncovered in "The Selfish Gene" by Dawkins are the competition as well as its role in the development of the replicators. With this concept, the author points to the core of the Darwinian theory: the effect that environmental pressure exerts over replicators and how the competition for resources and space shapes them, as well as how more successful mutations can maintain, multiply and compete with other memes in the same space (Dawkins, 1976, pp. 18-19). Accordingly, it is possible to propose a first characterization of the concept of meme as a unit of transmission that can replicate itself by means of imitation, and that possesses three characteristics that make it successful: longevity, fecundity, and copy-fidelity. It is sensitive to environmental pressures including the ones caused by its peers and is non-teleological (Dawkins, 1976, p. 18). In addition, it is possible to say that memes behaviour is technically, and not metaphorically as living structures, as pointed out above in Dawkins (1976, p. 192). The present research aims to go beyond the original definition of meme, creating a formal definition that synthesizes other visions and uses of the concept provided by other authors, while covering the transformations of the principle over time. Consolidate a broader concept of meme gives more stability to the construction of the concept of "Internet meme". As a matter of fact, the present research assesses five theorists that have studied the concept of meme and are, simultaneously, up to date in the research field of meme studies: Dan Sperber, Susan Blackmore, Daniel Dennet, Mogens Olesen and Richard Dawkins. The cognitive scientist Dan Sperber understands meme as a synonym of cultural replicators (based on the definition provided by Dawkins), defined by the author in terms of representations. It explains the replicators have a representational basis, they are symbols and associations in the human mind. What is more, there are two main kinds of representations highlighted by the author: the mental representations, which are internal to the subject, such as beliefs; and the public representations, which are external to the subject, such as paintings (Sperber, 1996, p. 24). However, there is a third representation type derived from the previous two, the cultural representations, understood as a combined subset of the public and the mental representations within a social group (Sperber, 1996, p. 33). Consequently, Sperber assesses the transmission, media and copy fidelity of representations in the same way as Dawkins considers memes. For Sperber, there is no difference between representations and memes. He exemplifies this subject by comparing the oral transmission, which he states to have a low reliable means of reproduction and creates low fidelity copies; with other kinds of transmission, as the writing, with a higher reliability and copy fidelity (Sperber, 1996, p. 32). A representation can be slowly transmitted over generations and are comparable with endemics; other representations spread rapidly thorough a whole population and have a short life-span, they are comparable with epidemic" (Sperber, 1996, pp. 57-58)[the italics are mine]. As a matter of fact, Sperber is not only taking representations to an epidemic layer in a metaphorical way, but in a technical way. Also, he suggests two ways of representations can propagate: vertical (over generations, as genes do), and horizontal (across a certain population like viruses). This jump to the field of epidemiology in the characterization of memes has important ontological consequences that will be closely examined later on in the text. On the other hand, Psychologist Susan Blackmore takes the original definition of meme proposed by Dawkins in 1976 with other emphases. First of all, she stresses the role of imitation as central for the replication of memes, stating that it is what makes humans different from animals. Thus, moving the concept from the field of biology to the field of social learning (Blackmore, 1999, pp. 3, 4, 47). Second, Blackmore defines replicators in a broader sense than the one of his creator, as: "anything of which copies are made" (Blackmore, 1999, p. 5). Finally, Blackmore adds an actor to the meme replication chain, the interactor, defined by the theorist as "the entity that interacts with the environment. That carry the replicator inside and protect it" (Blackmore, 1999, p. 5). Therefore, opposite to the former characterization of meme by Dawkins, the units of transmission are not autonomous; they require of a subject in order to be replicated. Now, following the principles of Darwinian Theory propounded by Dawkins, memes are not teleological. Nevertheless Blackmore adds teleology and intentionality as another feature of the concept of meme: "[Memes] Interest in their own replication, like genes" (Blackmore, 1999, p. 4) [The italics are mine], reiterating this as a problem of the memetic later on in her text. She highlights intentionality and Lamarckism as one of the three problems the detractors of the meme theories have pointed to: "we cannot specify the unit of a meme, we don't know the mechanism for copying and storing memes, memetic evolution is 'Lamarckian'" (Blackmore, 1999, p. 47)[The italics are mine]. Later on, the stress added by the author in the intentionality of the memes will be a key element in the evolution of the concept. This transit will be adopted by Dawkins in 1993 in order to reformulate the notion. It is also important to add that Blackmore refers tacitly to the memes in an epidemiological way: "meme-immunological system was not well developed" (Blackmore, 1999, p. 19). This position keeps up a correspondence with the perspective of meme raised by Dan Sperber. The third meme theorist to be analysed, Daniel Dennet, takes the definition of meme closest to the former concept formulated by Dawkins. He defines meme, in a Darwinian basis, as the name of any item of cultural evolution (Dennet, 1995, p. 342). The Darwinian traces can be followed in three characteristics named by the author as variation, heredity, and differential fitness (copy-fidelity, longevity and fecundity for Dawkins). Dennet follows Dawkins in every aspect, except that he stresses the variation of a meme as its core feature instead of its stability, by defining copy-fidelity in terms of variation. Dennet, following Dawkins' proposal, describes memes as technically comparable to genetic evolution (Dennet, 1995, p. 345). Articulating this, the author propounds that memes in the same way as genetic evolution, are susceptible to the environmental pressure while propagating and mutating generationally. This proposal will play an influential role later on in the characterization of the concept meme. In spite of the technical analogy between memes and genes, the author alludes to the memes as parasites with intentionality (Dennet, 1995, p. 346); raising the problems of the teleology of memes as well as their direction of transmission again. It is a sort of Lamarckian replication of acquired characteristics as Gould and others have suggested. The very creativity and activity of human minds as temporary homes for memes seems to guarantee that lines of descent are hopelessly muddled, and that phenotypes (the 'body design' of memes) change so fast that there is no keeping track of the 'natural kinds' (Dennet, 1995, p. 355). Thus, the position of Dennet towards the Darwinian characteristics of memes is discarded. Specifically, Darwinian evolution depends more on high copy fidelity, whereas the meme relies more on a high rate of replication by means of a tool. This tool not only copies the meme, but transforms, invents, interpolates, censors and mixes them up producing different outcomes every time. A last thought-provoking idea from Dennet points towards other meme types not highlighted by previous theorists; this is what cognitive psychology would call bias. For Dennet, the meme filters each person has, act themselves as memes, shaping the environment, as well as their replication opportunities. The author exemplifies this in the following way: if a person ignores everything coming from A and, on the contrary, accepts everything coming from B; that person is giving the opportunity to all memes coming from B to replicate in his brain and none to the memes coming from A to do so. At the same time, the person may transmit that filter to other minds, for instance, by saying that A is not a reliable source, so other people will not attend to A and prefer B instead. (Dennet, 1995, p. 350). Olesen (2009), works in the development of the notion of meme based on theories of communication, defining them from this perspective. This is a different point of view compared with the ones raised previously as memes are explained under transmission of communication and not under information theories. Supporting his work on Dawkins, Dennet and Blackmore; Olesen defines a meme as: "any form of cultural phenomenon that can be copied from one mind to another" (Olesen, 2009, p. 71). This operationalization of meme positions the term as a social and cultural phenomenon from a starting point. Although, the author points out characteristics previously referred following the Darwinian Theory: a meme that is easy to learn, available to many and easy to remember, are more likely to spread and survive. He stresses the idea of memes behaving like a virus, with memes battling for being transferred from brain to brain. In fact, the author points out the lack of autonomy of a meme compared with a gene in matters of hosting and transmission: "A meme is not a true form of life like a gene. Though, it is more like a virus and in that way we are hosts to parasites. A meme relies on his host to reproduce itself" (Olesen, 2009, p. 71). Accordingly, it is possible to state that Olesen accounts for the quid of the meme-gene analogy problem, not as a matter of autonomy/dependence of the replication units or a teleological question. For the theorist, it is a theoretical problem created by dissimilar definitions of the term by different theorist including its creator; this fact will be developed in the next paragraphs. Dawkins, in The Blind Watchmaker(1986), modifies his former definition of meme. In his own words, the meme concept is still comparable with the DNA, but instead of being defined as the unit of transmission, it is defined as patterns of information. This implies that memes are, in fact, more complex than a unit. Simultaneously, he introduces an agent for the meme to reproduce, suggesting that contrary to the DNA, memes have no autonomy. The new replicators are not DNA [...]. They are patterns of information that can thrive only in brains or the artificially manufactured products of brains - books, computers, and so on. [...] As they propagate they can change - mutate. And perhaps 'mutant' memes can exert the kinds of influence that I am here calling 'replicator power'. [.] Cultural evolution is many orders of magnitude faster than DNA based evolution, which sets one even more to thinking of the idea of 'takeover'. And if a new kind of replicator takeover is beginning, it is conceivable that it will take off so far as to leave its parent DNA (Dawkins, 1986, pp. 157-158). According to this statement, the author makes a rupture with his previous conception of meme by accentuating the mutation capabilities of the meme. This contrast with the argument rose in his text from 1976 where stability is said to be what yields success to the DNA. In other words, Dawkins is assessing the mutational capabilities of memes in the same way of a virus that is transmitted horizontally, instead of a generational mutation. There is also an influential development on the author's position in The Blind Watchmaker. Contrary to his opinion quoted in the selfish Gene in the words of N. Humphrey, where he states that the relationship between gene and meme is a technical relation; Dawkins reckons the relationship between memes and genes as only an analogy "between true Darwinian evolution and what has been called cultural evolution" (Dawkins, 1986, p. 196). According to the previous paragraph, it is possible to identify ontological turns in the notion of meme, all of them brought about by its original creator. The now called analogy is not anymore related with DNA evolution but with a viral and epidemiological perspective. The analogy possesses two proprieties: one associated with its way of reproduction and a second connected with the salience of the meme for it to be acquainted, therefore, replicated by others. Dawkins assesses populations memes like, for they can spread themselves in an "epidemic" manner. Parallel to this affirmation, he is underlining the role of stability and variation in viral reproduction. When this perspective is introduced, the meme concept is subject to a teleological turn: the goal of the meme is to spread and replicate. This perspective shares the principles of Lamarckian evolution; thus, disregarding the Darwinian perspective that the author used when defining the term for the first time. Assessing the aforementioned authors and the problems rose by the disagreement between their definitions of the term meme, the main perspectives of the term and its devenir will be discussed in the following sections. This will be done, in order to surpass the conflict with the operationalization of the term and, at the same time, generate a holistic definition that agrees both with the general points emphasised by the authors and a contemporaneous perspective of the term. Perspectives about Memes I: Genes vs. Virus. As stated in the previous section, one of the main issues when defining the concept of meme is to typify the way it replicates and spreads. Despite of the fact that the early definition of meme is based on a purely genetic perspective (a proto-form of DNA, a simple molecule able to self-reproduce) the becoming of the notion has taken other branches, even for Richard Dawkins. Besides, every change in the characterization of the term influences its ontology. In addition to this, a virus cannot self replicate; it needs an agent or host in order to do so. This marks an important difference with the prime mould-unity proposed by Dawkins (1976), in the sense that thinking about a meme in terms of a virus is thinking about a complex unity. In the first case, the behaviour of memes will correspond to the deeds of emergent agents that can self-support their procreation in a proper environment. Defining meme in the second way depends on a complex unity that behaves like a system and needs a host to self-copy. Meme's direction and speed of replication are affected by the change in the defining metaphor, as well. In the same way, as stated by the abovementioned authors, the genetic metaphor entails a vertical transmission; that is to say: from generation to generation, inside a certain population, and in a determined environment. From an epidemiological perspective, a meme can be transmitted horizontally; that is in the same generation, to several agents belonging to one or different groups, inside or outside a specific environment. This change brings about an inherent increment of speed in the reproduction as well as augment of reach. Defining meme as a computer virus following Dawkins in 1993: "2 (also computer virus) a piece of code which is capable of copying itself and typically has a detrimental effect, such as corrupting the system or destroying data." (Dictionary). It is possible to surpass the problem of self-replication created by the change of metaphor. On the contrary, a new problem arises with this analogy: a virus can self-replicate, but only by means of a host; what is more, such defined virus needs a creator in order to exist. As a result of this change and the transformations it generates, the strength trait of the concept of meme is changed. As Dawkins points out in his first definition, a gene can mutate, but its strength lies in its stability. The mutation is just a vicissitude, and if it is more or less successful in the next generation is a matter of chance. On the other hand, the strength of the virus lies in its capacity of mutation, which helps it to change hosts and environments and be difficult to annihilate. Accordingly, when referring to memes, each metaphor places its strong point in a different and somehow opposite quality. Thus, while trying to solve the unevenness created by the dissimilar definitions and metaphors underlying to the term memes, new questions arise. The following questions will lead the next section: which are the components of a meme that are maintained or mutated? Which are the characteristics of a meme passed on to the next generation or individual? Perspectives about Memes II: What lies beneath, structure or meaning? When meme theorists refer to the concepts of stability and mutability, they are standing for what is constant and what changes in a simple biological unit. The DNA, for instance, is a protein chain which structure is steady while the order in which proteins are aligned changes. In a virus, either the DNA/RNA or the protein coat changes; it can even develop other features allowing it to "survive" longer. Nonetheless, when talking about memes it is difficult to tell what remains and what mutates. What is more, is it the same meme after it has mutated? According to the previous theorists, there are essentially two things that can change or remain in a meme, shaping them: structure and content (semantics). Dan Sperber defends the structural approach, understanding the meme transformation as resemblance in the structure and a semantic change. He states that in spite of the transformations or bias given by the medium to a meme, the invariability of structure is what is transmitted. (Sperber, 1996, p. 108) The author uses the little red riding hood story in order to exemplify this approach. He explains that the tale/meme possesses a structure that shapes it, putting into perspective the content of the tale. If you are told a tale with different characters but the same structure, you will identify it as a copy of the little red riding hood tale (this is, of course, in the case where you already know the story). What is more, the structure is so important to the meme that an incomplete version of the tale is less likely to be replicated than a complete version of it. The other perspective is the content approach; Daniel Dennet defends this approach, understanding the meme in terms of language (semantic): "What is in common, of course, is not a syntactic property or system of properties, but a semantic property or system of properties: The story, not the text; the characters and their personalities, not their names and speeches" (Dennet, 1995, p. 356). In other words, when talking about what changes and what is maintained in a meme, Dennet is for the idea that what identifies memes when they are passed on is their content, their semantics and meanings. The current research proposes a combination between both postures, arguing that both are characteristics that can be passed on in memes. This perspective also underlines that depending on the meme one of the two can be more salient than the other. To illustrate this position, take a vertically transmitted meme as a Catholic mass. This ritual is passed from parents to children via immersion (children attend to the ceremony) and repetition (they attend periodically). Now, the structure of the ritual does not change as it has a beginning, lectures from the bible, communion and an ending. Nonetheless, this structure can be changed (e.g., people can sing during the whole mass, there can be not communion, the mass can be celebrated in Latin, etc.) while the meaning (praise the lord) is maintained and transmitted. Now, imagine that you go to another culture and find a ritual that is totally similar to the mass, but whose purpose is to give thanks because there is enough food to eat. In that case, the structure will be the same, but the meaning will be different. At the beginning, you might think that it is a mass, finding out later that the meaning is entirely different. In that circumstance, what is passed on is the structure, not the meaning. Therefore, the structure and meaning of a meme are independent, but they are connected to some degree that each one tells something about the other. Another ontological issue on defining meme is whether it is or not teleological. It has been acknowledged how some authors, based on the analogy of DNA and Darwinian Theory, argue that memes are not teleological as they obey the laws of Darwinian Natural Selection. As pointed out by Dennet (1995, p. 345): "Meme evolution is not just analogous to biological or genetic evolution, according to Dawkins. It is not just a process that can be metaphorically described in these evolutionary idioms, but a phenomenon that obeys the laws of natural selection quite exactly". The number of artefactual replicas of a would-be cultural item is only a poor, indirect indicator of its genuine cultural success. [...] the cultural importance of a public production is to be measured not by the number of copies in the environment but by their impact on people's minds [...] each token is a replica not of one parent token nor...of two parent tokens, nor of any fixed number of parent tokens, but of an infinite number of tokens some of which have played a much greater 'parental' role than others. Different to the parametric integration proposed in the last chapter for the different theoretical approaches to memes, it is difficult in this case to advocate for integration. Instead, a counter example approach will be used. The first example retakes the case of the ritual brought in the last chapter as it is an already exposed case of vertical transmission (that is, slow and generational). The main questions that arise in this case are: how did the ritual begin? What was its purpose in the first place? (1) It is possible to hypothesize that the ritual began in order to fulfil a necessity (suppose, to make it rain). (2) It could be that the ritual began when an action was associated with a consequence (suppose dancing and rain), or (3) the ritual was associated with a belief (the god of rain is angry, and he will bring the rain back if by making him happy). These three scenarios are teleological. The ritual (as a meme that is passed from generation to generation) holds a structure, a meaning, and intentionality. In other words, it was created with a purpose. A counter example is a piece of gossip. A piece of gossip has the characteristics of a viral-shaped meme. It spreads horizontally, quickly among a population, mutates from person to person, has a peak in its transmission and then dies, although sometimes it can endure the time. The question here is: does it have a purpose or does it just auto-replicate willy-nilly? From a sociological perspective, it is possible to say that gossiping has a social function. The purpose of the gossip is to inform, to update the information of people in a certain environment; thus they can tell, for instance, who is available for marriage. Gossip tells the state of a particular institution in a certain environment, at a fixed moment. As a result, it is possible to argue by means of examples and theories that, in spite of their way of transmission, memes behave in a teleological way. They have a purpose; therefore, their evolution is Lamarckian and not Darwinian. Having assessed the three main issues in the unevenness of the concept of meme (namely: direction and speed of propagation, object of transmission and teleology) and having arrived to a common ground in the characteristics of the concept, it is possible then to ensue the construction and characterization of a up to date concept of meme. This will be carried out in the following section. In order to create a synthetic definition of meme, different perspectives brought by the authors stated above will be compared in order to obtain relatedness of the definitions as well as differences between the uses of the concept. With the comparison done, the different aspects of the concept will be discussed, while the similar aspects will be synthesized in a restructured manner. Afterwards, this concept will be described under the parameters of communication theories. A second step in the creation of the academic definition of IM is to take the definitions of IM existing on the internet and, by using the same procedure as before, find similarities between the concepts and discuss the differences. This in order to create a synthetic definition of what an Internet Meme is on the internet. The last step consists on the integration of both the Meme and the IM definitions in a whole academic definition of Internet Meme. It is possible to describe this whole process as a combined method between text analysis and content analysis, using both analytical and synthetic procedures. Construction of the concept of meme: adaptation and characterization. After explaining different theoretical perspectives about memes, as well as their main problems, overcoming its ontological problems based both in theories and examples, it is time to develop a definition of meme that is: a) up to date, b) integrates most of the theoretical positions and change of the term, and c) that enables meme characterization. With this in order it is possible to proceed and define what an internet meme is. In order to create a synthetic definition of meme, the main characteristics discussed above will be isolated: Evolutionary perspective, biological perspective, definition type, teleology, direction of propagation, speed, complexity, reach, autonomy, strength feature, and modus of change. This will be done with the purpose of gathering the strongest, more recurrent and more up to date positions in the usage of the concept of meme. The characteristics for a meme to be successful (longevity, fecundity, and copy-fidelity) as well as the sensitivity to environmental pressure will not be included as part of the list as they have been assessed to be stable characteristics along all the studied authors. 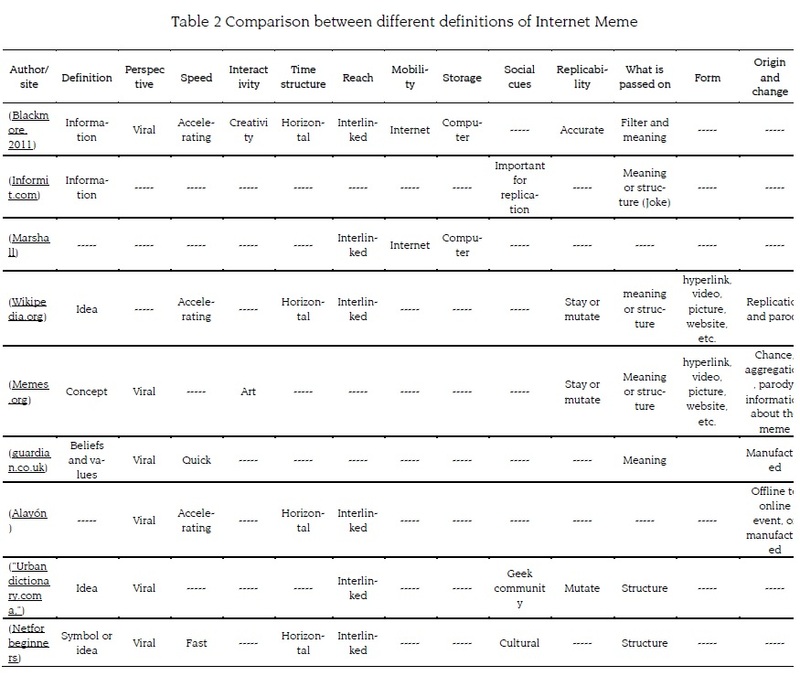 In table 1, it is possible to have an overview of how different perspectives and characteristics of the term meme transform over time since Richard Dawkins conceived it in 1976. Taking this into account, it is possible to make a new definition of the concept of meme that allows going beyond the concept, and characterizing phenomena as they present in the real life. 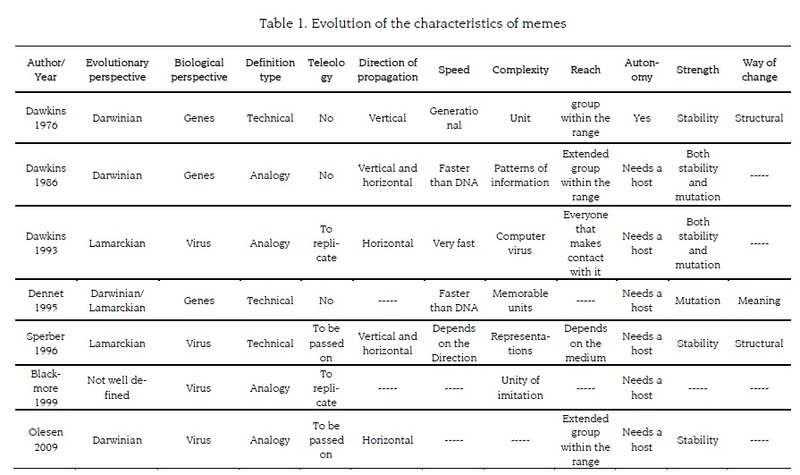 Accordingly, by taking into account the strongest positions indicated in table 1, it is possible to distinguish two types of memes: the meme-gene and the meme-virus. The meme-gene is a meme derived from the Darwinian Theory and can be defined in the same original parameters used by Dawkins. These memes are characterized for being non teleological, spread generationally as in the ritual and transversally as in the piece of gossip. It is defined in terms of replication of unities of information, and for their replication, both their stability and variability are important. They are an analogy based on genes, although they need of a host in order to replicate. Their spread speed and reach depends on the kind of meme transmission (vertical or horizontal). The meme-virus is defined according to Lamarck Theory of evolution, in which the agents (in this case the memes) make an effort for its reproduction, and this effort affects the next generation. It is based on an analogy with virus, being at the same time more complex; thus, allowing disciplines as endemics and epidemiology to study them. Moreover, this complexity allows the memes to diversify from representation to unit of imitation. This meme type is teleological as its goal is to be passed on and replicate. Their way of transmission is both vertical and horizontal, but its main form is horizontal. They need a host in order to replicate, and their speed goes from fast to very fast, with a wide reach, making possible for anyone in contact with the meme to get it. These memes rely more on their mutability than their stability in order to survive. Concerning to "what is passed on" with a meme, it is possible to state for both kinds of memes that a combination of structure and content is always transmitted. They are not only linked one to the other, but also to its hosts and environment, making both important when it comes to understand and characterize a meme. To round up, the meme-gene is an early theoretical evolutionary approach to the development of the culture, created by Richard Dawkins and deepened by other theorists. Nonetheless, the concept has evolved and adapted to the development of the information technologies, in such a way that its own creator changed, later on, the analogy and definition of the concept. This change is then followed by other theorists. Following that line, the meme-virus definition is a contemporary characterization that goes beyond the theoretical speculation and enables the description and analysis of some cultural phenomena. Operationalizing memes based on communication theories. The purpose of this section is to define the concept of meme so that it is possible to go beyond the definition, creating an academic notion of Internet Meme (IM) susceptible of operationalization. In order to do this, concepts from communication theories will be used as they can bridge the formal definition of meme and the informal definition of IM that can be found in the internet. This will, at the same time, create a concept of IM bound to the mass media lexicon. On the contrary, it is possible to determine how the term meme is related with communication theories, if it is a meme created in order to spread in the media as Blackmore (1999) states, or whether they act as a piece of information that is transmitted (Dawkins, 1986). Nancy Baym (2010) proposes seven characteristics of the new media: interactivity, temporal structure, social cues, storage, reach and mobility. These parameters have a significant coverage, at the time that they enable the characterization of communication phenomena in terms of media theories. - Temporal structure refers to the synchronic or diachronic characteristics of the message. The synchronic quality refers to instant communication such as a telephone. Diachronic refers to a delay between the emission of the message and its reception. A third temporal structure is the anachronous; this can be understood a way of communication that lasts more than it is probably intended to, reaching not targeted population, as for instance, the Viking runes. - Storage is the capability of the medium to store information. Concerning that point, human brain has few capabilities of storage compared to a computer; resulting in biased, confabulated, and less accurate information. On the other hand, a computer can store exact information in big amounts. - The concept of replicability relates with the capacity to pass the information, as well as the degree this information can be degraded every time it is transmitted. - Reach is the range in which the message can be spread; in other words, how many people can get the message at a given time by means of a definite media type. - Mobility refers to the degree in which the message can be portable or allows access to a certain source regardless of its location. These characteristics interact with each other, conforming different categories of communication depending on how they are interwoven. In the opposite direction, each communication actor has its own set of interwoven characteristics. A meme is a unity of information (which can be a representation, a pattern, a rule, or an imitational icon. In other words, a content and a structure) that replicates by passing on via communication (one to one, one to many, or many to many). It requires a medium (channel) and an agent to be transmitted. It is generally non interactive as it does not necessarily provide feedback. Its time structure is variable as it can be spread vertically and horizontally, and its reach depends on its time structure as well as the channel used to be transmitted. Its mobility, storage and speed depend on the technologies available at a certain time (with the current computer technologies is as fast viral). Its success in replication and mutability or adaptability depends on the social context where the meme is put into play, so it can stay or be ignored, and in case of staying it can be adapted by other social contexts. A formalized concept of meme, operationalized in terms of communication disciplines it is time to approach the concept of "internet memes". Roughly speaking, an internet meme is a phrase, image or video. It can be created or based in a real life event that spreads through the internet causing people to replicate it. Sometimes it spreads in the same way and sometimes it spreads by means of change. IMs make use of humour (Hyperbolic, mentalist, by substitution, by subversion. Puche-Navarro (2004, 2005)) in order to spread its meaning and/or structure. For the conceptualization of internet memes, two steps will be followed: first: a series of definition of IM taken from the Internet will be indexed. Then, their features will be tabulated. Finally, the concepts will be categorized and contrasted with the definition of meme brought about in the previous section in order to create a formalized concept that allows the characterization and analysis of internet memes. (See table 2). An internet meme is a unit of information (idea, concept or belief), which replicates by passing on via Internet (e-mail, chat, forum, social networks, etc.) in the shape of a hyper-link, video, image, or phrase. It can be passed on as an exact copy or can change and evolve. The mutation on the replication can be by meaning, keeping the structure of the meme or vice versa. The mutation occurs by chance, addition or parody, and its form is not relevant. An IM depends both on a carrier and a social context where the transporter acts as a filter and decides what can be passed on. It spreads horizontally as a virus at a fast and accelerating speed. It can be interactive (as a game), and some people relate them with creativity. Its mobility, storage, and reach are web-based (Hard disks, cell phones, servers, cloud, etc.). They can be manufactured (as in the case of the viral marketing) or emerge (as an offline event taken online). Its goal is to be known well enough to replicate within a group. In general, characteristics of an IM are the same as the ones of a meme-virus, but IMs possess a unique way of spreading and mode of mutation that is disjunctive among meaning and structure, to the point that changing both would create something different. Nevertheless, an IM can be passed on conserving both, meaning and structure, but changing the form. The form of the IM is most variable (e.g., the same scene with other characters or other background will be the same). Additionally, it possesses its own method of mutability depending on the context (e.g., people without internet will not be able to understand internet memes). Following, the use of this recently coined definition of IM will be used in order to characterize two internet memes, and exemplify how the developed academic definition can be used for media and meme studies. The purpose of this section is to exemplify how to use the definition of IM developed in the previous pages. The definition of IM, as a full operational characterization (including the analytical parts of the concept), is susceptible of being used to analyse, operationalize and systematize IM for academic study. Aiming to illustrate these qualities two IMs will be used: the Zalgo meme, and the pepper spray cop meme ("Knowyourmeme.com a,") . To invoke the hive-mind representing chaos. Invoking the feeling of chaos. With out order. 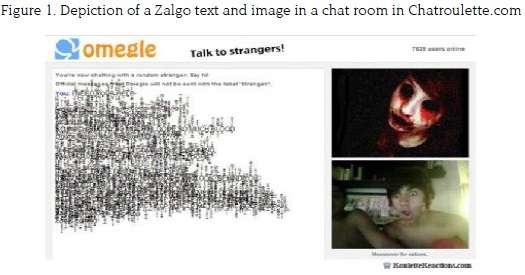 The entire room is filled with Zalgo ("Urbandictionary.com b,"). Several similar definitions were created after this, popularizing Zalgo as a concept as well as a graphic style (See figures 1 and 2). When looking at Zalgo depictions and their variations, it is possible to see the constant appearance of deformation, (black) blood, cephalopod shapes, spikes, and occasionally the phrase "here it comes" referring to Zalgo. Occasionally it is possible to see "the Zalgo text", a degenerated font that cannot be read. As a matter of fact, when watching at the spectrum of Zalgo mutation, there is a structure that is always repeated. This structure can be applied to several kinds of images, real people, cartoons or comics, but they always share the same characteristics. This IM emerged from H.P. Lovecraft's literature, and it is understood principally by people related with this literary style; ranging from unknown to repulsive to public outside that context. 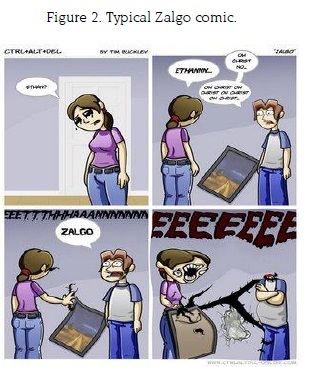 Zalgo itself represents contamination and degeneration, carrying a meaning, but this meaning is context-less, making the meme random providing nothing more than the degenerative ending. In Zalgo's case, it is possible to say that it bears a structure with a meaning, both salient in a particular context. The IM spreads horizontally within the main group, then vertically to new people that join later in the group. It makes use of hyperbolic and subversive humour in a dark way (black humour). The goal of this IM is to remain scary and unnamed (tacitly stated in its definition), alluding to H.P. Lovecraft's literary work. The second meme is the pepper spray cop meme, called "Casually pepper spray everything cop"("Knowyourmeme.com c,"). It started on November 2011 when a group of students gathered for an occupy protest were sprayed with anti-riot pepper gas directly in the face by a police officer. After the video and images went to youtube ("Youtube.com,") the images started to spread, leading to several parodies, most of them (KnowYourMeme:PepperSprayCop) suggesting political issues (e.g., the police officer in the place of the statue of liberty, or pepper-spraying the American declaration of independence) (See figures 3, 4 and 5). Actually, this IM was not meant to be a meme. After someone uploaded the video to the Internet in order to denounce the overuse of force by the police, it spread and rose as a meme. This IM is known more in academic and political contexts due to its content. Both its semantic and structural elements are exploited in its mutations. The humour in this case is created mostly by means of subversion and substitution. When looking systematically through the pictures there is something that is transversal to the different versions of the meme: the police spraying, and/or a political content of freedom/war; sometimes other political contents may appear, for instance, racism. It is not possible to state anything about the reach or time structure of this IM, as it emerged a short time ago and it is necessary to retrace its evolution and salience in order to understand these cues. What is certain is that the social context for this IM is very important, both for its replication as well as for its permanence among time. Table 3 summarizes the different characteristics these two IMs have in common, as well as synthesizing similarities based on the definition developed through the text. After examining the concept of meme in seven texts from five different authors two up to date definition of memes were found, one related with the genetic reproduction perspective and one related with a viral manner of reproduction. In the analysis, three important questions about the concept of meme were raised: a question for its analogy, a question for what is passed on and a question for its teleology. About the first question, it was found that the most updated definition of the term meme is related with virus reproduction and epidemiological perspective. The second question highlighted the importance of both meaning and structure for the preservation and mutation of memes. The last question is still unsolved, certainly memes seem to evolve in a Lamarckian way, but some authors still compare it with Darwinian evolution. This, in addition, raises the question whether memes are themselves teleological or their intentions belong to their agents. This last point needs to be studied further, not only in a theoretical way, but also in a practical manner. The definition of meme in terms of communication theories also needs to be deepened further, as only Nancy Baym's theory were used, being the one considered more covering and up to date. Other theories and other perspectives can explain in a better manner the link between communication theories, memes and IMs. In reference to the IM's definition, it is possible to assess it as a stable and inclusive definition, appropriate to make analysis based on theories of communication as well as psychological, social and cultural studies. However, it is important to assess it in other ways in order to proof-test and tune the definition even further. The concept of meme is not a static concept. Even though the first definition of meme proposed by Richard Dawkins in 1976, is the most used and quoted definition of a meme when referring to social, cultural and internet phenomena analysis, it is a concept that has yet to evolve. Its former author transformed the meme definition, and some theorists followed this change helping the creation of a new conception of the term meme. This new definition allows the characterization of memes for studies in fields like communication, humanities and social sciences, opening the path for a new research type in information and media content. While referring to internet memes, it is possible to say that they perfectly fit in the epidemiologic theory of memes, with certain characteristics that are only proper of its own kind, allowing the emergence of new patterns of interchange, exchange and reproduction. Their themes can go from pure silliness to important social changes and the social environment, while the places it strews take an influential role in their development, pervasion, and decadence. The creation of a definition and characterization of the IM not only approach the academic community to the phenomenon, but also can work in the opposite direction, by letting the academy characterize other phenomena in order to differentiate its patterns as memes or not memes, so it is possible to predict its behaviour in the cyberspace.